Splash pages, you gotta love 'em. A blank canvas where the artist can hit you with a large dose of illustrated 'wow'. For this week's splashie, I'm featuring the first page of the best book of the 90's; The New Warriors - where under Mark Bagley's pen Night Thrasher is about to drop Richard Rider off a rooftop. 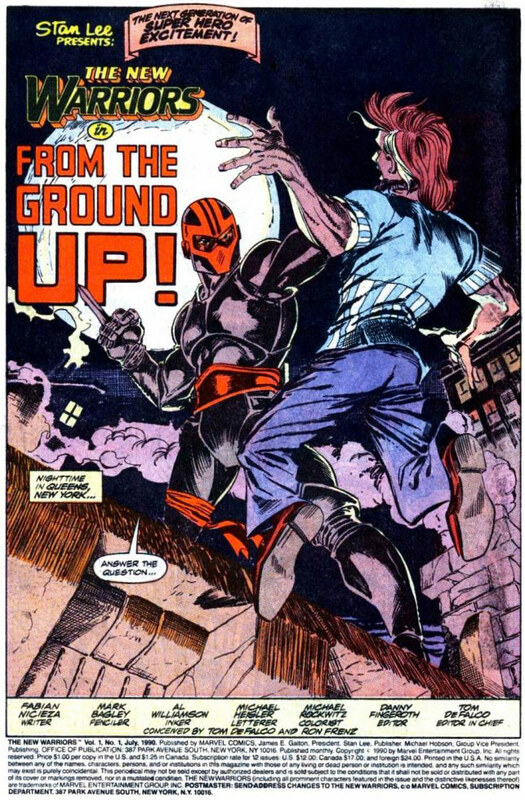 While Thrash's guess the fright of imminent death would reactivate Rich's latent Nova powers was right (while oddly not necessitating a clean pair of pants) - writer Fabian Nicieza sure knew how to launch a series with a bang! 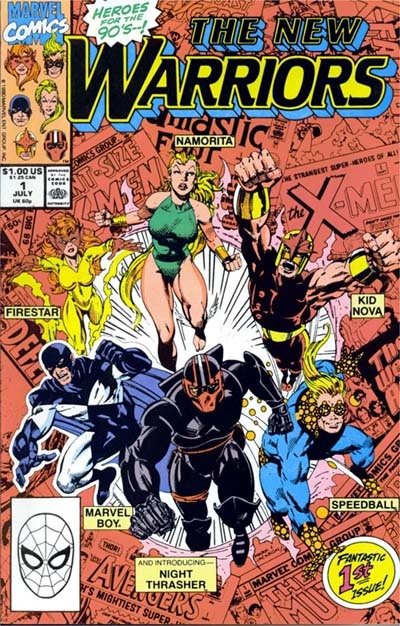 The 90's was a great period for Marvel team books, and The New Warriors - the non-X, non-Avenger, Non-anything title of a few random super-teens from around the Marvel U, lead the pack with it's still legendary first 50 issues. While 'New' probably wouldn't be in the teams title should the original now 30-something line-up reform, it would be kind of cool to see The Warriors regroup from time to time. Ach...now you've got me feeling all nostalgic Danny-boy. I need some Speed-Ball. You know Random - I think a Speedball series would be awesome right now. Original powers, unique way of moving visually and upbeat and humourous - he's the perfect dude to fill the old Spidey niche!